We all have to eat for nutrition and energy. How we eat can have a major impact on our budget. The classic food stop for the budget-minded is the fast food restaurant, so we will cover these first. 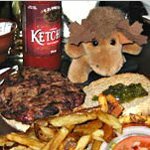 But you would miss part of the Banff experience if you did not experience some of the many fine and affordable local restaurants. 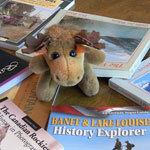 Besides picnics, searching out and enjoying the local atmosphere and food is a major part of our Banff vacation. 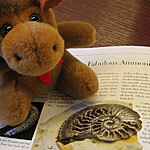 These foods include the famous Alberta beef, wild salmon, pub food, and a variety of ethnic food. If you really want to splurge, there are several world-class restaurants in Banff including the Banffshire Club at the Fairmont Banff Springs Hotel. Some friends of ours went all-out to celebrate their wedding anniversary there which included an all inclusive dinner for two at the Banffshire Club for $400. This is not in our budget! They said it was the best dinning experience, food and service, they had ever experienced and they would remember it for the rest of their lives -- so it may come as a surprise that the Fairmont Banff Springs Hotel has its own fast food restaurant with prices starting at $2.50. Surprisingly Banff is not loaded with fast food chains. There is the ubiquitous McDonald's and Subway. 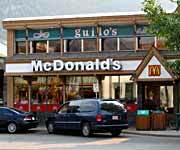 However, there are many other places that meet our definition of a fast-food restaurant. No tipping, an inside place to sit, and fast food service at low prices. You can often shop in a grocery store or deli and make a more varied and nutritional meal than you can eating fast food. Your picnic surroundings can be much more pleasant than the inside of a fast food restaurant. 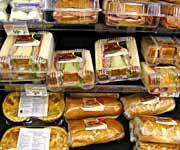 But be careful here, you can often spend much more in a grocery store buying a picnic than a fast food meal would cost. 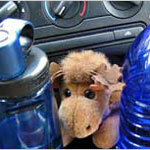 Consider getting a cold meal at a fast-food restaurant and taking it with you on a picnic. We discovered the Rose & Crown by reading the menu posted outside the door. Most of the restaurants along the main drags in Banff do this. Dee was looking for fish and chips, preferably in a pub, and the Rose & Crown met this criteria. So up two flights of stairs we went to the outdoor roof top and its great view of the surrounding mountains. The fish and chips were great ($9), but I ordered the BC Salmon Filet Burger with a spinach salad ($10). We each had a half-pint of Kokanee beer on tap. Dolores took a taste of my salmon filet sandwich and spinach salad and decided that was going to be her order also next time. Now the Rose & Crown is the first restaurant we visit each year in Banff and we eat there at least once more each visit. One of the few places that gets our multiple visits each year. 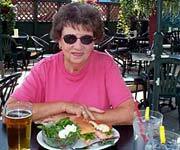 Our order is always the same, salmon filet sandwich with spinach salad and a half-pint of Kokanee. We can hardly wait for the next time. 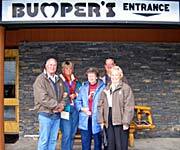 Bumpers - The Beef House, has the motto "If you haven't been to Bumpers you haven't been to Banff." It wasn't until our second visit that the repetitive advertisement got us to the restaurant. 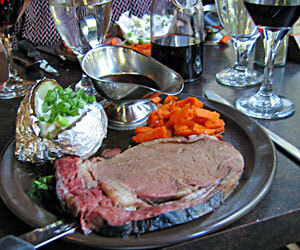 The prime-rib roasts of Alberta beef has taken us back there each year. 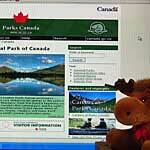 Many Banff restaurants advertise Alberta beef and it may be better than Bumpers, we don't know. 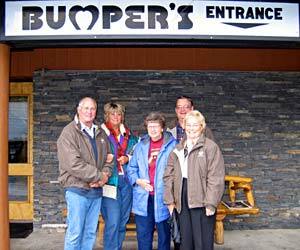 But if you are on a budget, Bumpers will satisfy your urge for good prime rib. The prices range from $17.95 (Ladies cut) to $23.95 (Man Mountain cut). The meal includes an all-you-can-eat fresh salad bar, a vegetable, and choice of baked potato, french fries, or rice. We settle on the Senior prime ribs, 5 oz, that also includes your drink and ice cream as desert ($15.95). The western A-frame atmosphere has a windows along one side that looks out over a nature setting. Bumpers is a must for us each year.